Dear loving Swami was known by devotees the world over for the multitude of miracles that he performed during his 85 years in physical form; miracles such as raising people from the dead (even when the corpse had started to rot), control over the elements and the ability to appear in a multitude of places simultaneously, to name but a few. But what I personally found most heart warming about Baba was his human side. Maybe not quite as spectacular in the eyes of the average devotee, but he had this way of showing his human-ness in the most simplistic of ways; ways that really touched the heart. He always used to say that we should never try to comprehend him because he was quite simply beyond comprehension. But he also used to say that the reason he walked among us, breathed the same air and ate and spoke just like any other normal human being was so we could relate to him. So, I suppose it’s for this reason that there was also something incredibly human about Baba. The late professor Gokak who was very close to Swami for a number of years recalled the time when he accompanied Baba on a trip. The professor spoke of how Baba had forgotten his razor, saying “so I just gave him mine”. He also spoke of how easy it was to forget just who Baba really was because sometimes “we would laugh and joke together and in those moments he was simply my friend.” But one of the most amusing stories I ever heard was when Swami was much younger and he took a party to the Himalayas. He played snowballs with the group and also enjoyed himself on a sledge. But during the same trip he visited a cave-dwelling sage and gave him the ultimate blessing by showing him his cosmic form. I was once blessed with experiencing Swami’s human-ness first hand whilst sitting in darshan during my first trip to Prasanthi Nilayam. I’d managed to get myself a prime spot directly opposite where Swami used to make his entrance; I couldn’t believe my luck, and what happened next was absolutely amazing. Sitting just along from me, to my right, was a man. Behind him was a younger man holding a child. She was a beautiful little girl and they were obviously all connected. At one point the younger man passed the little girl to the man in front and he had her on his lap fanning her. Immediately two Seva Dals approached and told the man that the child would have to be passed back. This made the Seva Dals look particularly mean, but I didn’t realise it at the time that children were not allowed in the front row. Apparently there had been various incidents over the years and eventually the ruling was made that children were no longer allowed to sit in the front row. The man protested long and hard but in the end he had to relent and pass the child back to the younger man. I also felt for the Seva Dals because on the whole they do a fantastic job, they are all volunteers and it was not the fault of the two Seva Dals in question. The beautiful thing about this though, is that I was one of only a handful of people who actually saw this story unfold in its entirety, and I feel privileged that Swami engineered this so that I could witness it. As Baba approached one of the men gave the little girl a letter and they stood her up so that Baba could see. He has a way of letting his attendants know when to stop and when to start and which direction to wheel him in etc. The child held the letter out to Baba and he halted and motioned for her to come forward. He took the letter and she bent down and touched his feet. He then blessed her and a cheeky grin broke out on his face. As it did so a huge cheer went up and the section of the crowd that had seen this wonderful event in detail applauded. It was Swami’s way of letting us know that he knew what had happened with regard to the child not being allowed to sit in the front row; and there is simply no way that he could have seen the earlier incident as he was still in his quarters at the time. The face of the child’s father was an absolute picture and it was a truly wonderful gesture by Baba. The unfortunate thing is that because the hall was so packed only those near the front were a party to this amazing event, and only a handful saw the whole event from start to finish. I am truly privileged to be one of that handful. Baba must have been about ten feet or so away from me when he called the child forward. It was fantastic for me seeing Swami face on, and what I found striking was that as he approached he looked absolutely beautiful. I never thought I would ever describe a man as being beautiful, but Baba was not of this earth. He looked so tiny in his wheelchair but the power he gave off was absolutely awesome. 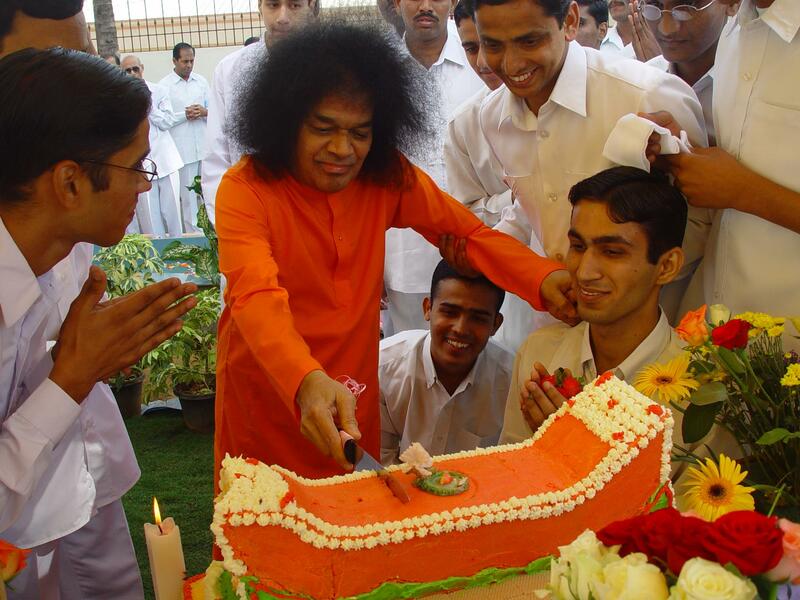 It’s now seven months since dear Swami discarded his physical form, and it would be ridiculous to say that his form is not missed by devotees everywhere. But everyone I speak to says the same thing; since Swami left his body it seems as though he is even more Omnipresent than ever. His love seems to be even more prominent than it was; if that is at all possible. I, for example, have lost count of the times since April 24 that he has made his presence felt within my heart and my eyes have filled with tears of joy. There’s definately something bubbling under, and I can’t wait for it to surface. This entry was posted in From The Heart and tagged cosmic form, God in human form, Omnipresent, Prasanthi Nilayam, Professor Gokak, Sai humour, Sathya Sai Baba, seva dal by Bloggin With Rich. Bookmark the permalink.